Rabbi Yosef Raichik is originally from Los Angeles, California and hails from a long line of Rabbis. He studied in many Yeshivot around the world, including France, Israel, and New York. Rabbi Raichik was ordained by the Beth Din of Sydney, Australia in 2001. 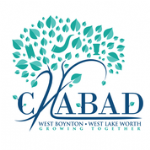 Together with his wife, Rebbetzin Shainy Raichik they have opened the Chabad in West Boynton to service the growing communities in West Boynton and West Lake Worth. They look forward to meeting, impacting and growing together with the wonderful individuals and families in the area. Shmuel Dovid and Laya, both born in Florida love to participate and help out at Chabad. They especially love programs for kids and look forward to celebrating Shabbos, holidays and special occasions with all of you.